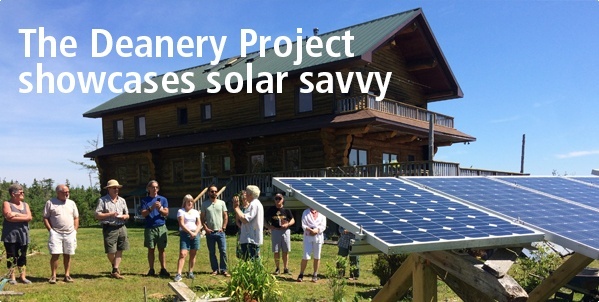 In July, the Deanery Project—a Nova Scotia community co-op that educates locals on sustainable building—partnered with Bullfrog to host an all-day renewable energy tour of the Deanery's grounds. Visitors toured innovative sites such as an off-grid residence featuring a small steam-powered lumber mill and two solar-powered EV chargers. The tour ended with a visit at the Main Hall's 6 kW solar roof—made possible with support from the bullfrogpowered community. Learn more! Bullfrog Power invited business leaders in Toronto to the third annual Sustainability Snapshot: a learning and networking event for environmentally-minded professionals. The event featured speakers from Unilever Canada, Burnbrae Farms and Just Food: leading organizations (and bullfrogpowered companies) who are innovating in sustainability within the food and agricultural industries. OLG (another Bullfrog Power customer!) was the presenting sponsor of this year’s event—read our full recap. Thanks to all who attended. Bullfrog Power just released its Green Energy Audit Report for 2017. The audit, performed annually by Deloitte, assures that renewable energy was produced and accurately counted and credited to you, the customer. View all of Bullfrog’s audits here. From July through September, award-winning singer-songwriter Tara MacLean is re-embarking on her Atlantic Blue summer tour in Charlottetown, P.E.I., which pays homage to East Coast music and its diverse roots. The show will be bullfrogpowered for the second year in a row! Be sure to read our Q&A with MacLean in our upcoming Bullfrog Buzz newsletter, and click here to learn more about her show dates. Sturdy. Sustainable. Affordable. In our latest blog post, bullfrogpowered Dresden Vision explains how it's possible to find eyewear that achieves all three criteria, as well as what makes Dresden's materials and operations eco-friendly. The Town of Black Diamond in Alberta is one of Bullfrog's earliest community project partners (since 2013!). The Town's Oilfields Regional Arena generates solar energy from its rooftop array—a project made possible with support from the Bullfrog community. The latest milestone: the Arena's solar roof has produced more than 170,000 kWh of clean energy from January 2014 to the end of March 2018—displacing the equivalent of 122 metric tons of CO2. That's the equivalent of not consuming 13,000 gallons of gasoline! In July, Bullfrog Power CEO Ron Seftel moderated a webinar discussion on the future of climate leadership and renewable energy in Ontario. The discussion, hosted by CoPower, featured some of Ontario’s leading environmental voices, and outlined how the province can work together to keep its climate commitments. Watch the webinar video here. At home or on the go, bullfrogpowered Eyedro Green Solutions can give you a look into how much electricity your home or business is using. Eyedro's special sensors measure the electrical current going into your home and how much power it consumes—helping you uncover waste, manage costs and take control of your electricity use. Learn more. Bullfrog is excited to hear that OREC (Ottawa Renewable Energy Co-operative) is on the cusp of connecting two new solar projects to the grid! The project sites are at Twin Elm Rugby Park in Richmond, Ontario and KIN Vineyard in the Ottawa Valley. Bullfrog provided early funding to OREC in 2013 to grow its membership and help the co-op seek out renewable energy development opportunities in the community. Read the news on OREC’s blog.